Ghosts (translated by Chris Andrews, published by New Directions) takes place in, on and around an apartment building in Buenos Aires on the final day of the year. A Chilean family is living on the roof of the unfinished building while the father, Raúl Viñas, works there as a caretaker. On a sweltering morning (northern hemisphere folk, take note: December = summer), the future residents of the building come to look at how things are progressing. All in all, the building is fairly packed – workmen, tenants, children and ghosts. Yep, ghosts. The ghosts are real, gliding about in the background, men covered in dust, naked and invisible to the visitors. However, the Chilean family living on the building are able to see the strange apparitions, and most of them simply accept the figures as part of the background. There is a method in his apparent madness though, and despite its brevity, Ghosts does deal with a few clear ideas. One is the difference between the Chilean main characters and the Argentines they are living among; in the sense that they are invisible migrants, the family are just as much ghosts as the real things. Aira describes the contrast between the Chileans and Argentines as one between rich and poor, delicate and brash, real and superficial. Patri’s mother Elisa explains that in Argentina, money is the only form of virility (I think the writer is trying to say something about his mother country here…). In contrast, the extended family are shown as people who can enjoy life and use time as they see fit rather than being strangled by it. Theirs is a relaxed existence, seizing the moment with little thought of the future, and it’s one which appears to work well. Raúl’s drinking may well end up badly, but it gets him through the day, and the wine (which he cools by putting the bottles inside the ghosts…) is drunk at exactly the right time. Even the melon eaten at the party has reached its exact peak at the time it is to be consumed. 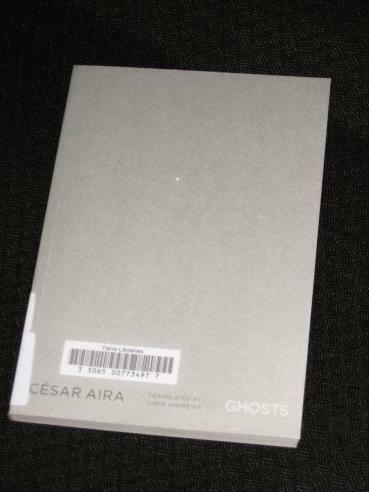 While I enjoyed Varamo, I wasn’t quite sure if Aira was my kind of writer, but Ghosts has convinced me that he’s definitely on my wavelength. There’s so much to like in such a short book, and while a lot is made of his ‘process’ of writing a page each day and then just letting himself be forced to move the story along, I suspect that a lot of thought does go into the stories. Certainly, I felt that this story was extremely cohesive, with all the tangled strangs coming together in a dramatic climax. Marina – No worries 🙂 He's an interesting writer, and the best thing is that he's written a lot of (short) books. Several have been translated into English already, but I'm sure there are plenty more to come.